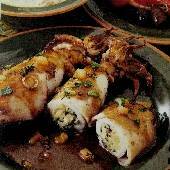 Grilled Stuffed Squid with Feta CheeseThe flavours infuse in this stuffed squid recipe with a creamy filling of marinated feta cheese. Squid or Calamari as it is called in Greece, is a popular fish dish served in the summer months in Greece. It can be cooked in many different ways. 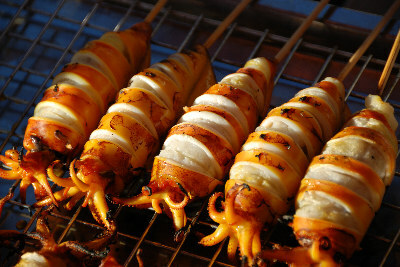 Barbecuing squid helps to bring out the sweetness in the flavour of the meal. Make sure the squid are well cleaned and rinsed, inside and out. If there are tentacles on the squid, remove them from the bodies and keep. 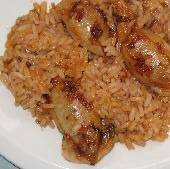 Lay the bodies in a single layer in a shallow tray or dish. Place the tentacles and the slices of feta cheese around the squid, making sure everything is in a single layer. Make the marinade by putting the oil, garlic and oregano in a bowl and whisk together. Remove one squid at a time and place 1 or 2 pieces of feta cheese and some of the oregano leaves inside the squid. 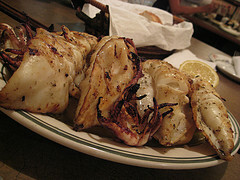 Preheat and oil a barbecue or grill on a low to medium setting and place the feta filled squid bodies onto the grill. Grill the stuffed squid gently for about 6-8 minutes. Turn them over and grill for another couple of minutes. When you turn the stuffed squid over, add the tentacles to the grill and cook until they crisp slightly. Serve this stuffed squid dish with a Greek Salad and crusty bread. Looks and reads great! I grill calamari stuffed with a saganaki cheese and drizzle them with a balsamic vinaigrette. 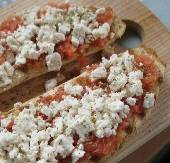 I will try them with feta!